Our agency, located in Belgrade, Montana, has a combined 30 years experience providing services in the health care industry. We serve Belgrade, Bozeman, Big Sky, West Yellowstone, Ennis, Three Forks, Twin Bridges and Gardiner. As independent agents, we research the options available for you in the Bozeman area based on your individual or group budgets and plan benefits. We have a goal as Blue Cross Blue Shield of Montana independent representatives to provide Montana with quality health insurance. We have a very high commitment to the members we service in Belgrade, Bozeman and surrounding areas to make sure their experience with Blue Cross Blue Shield of Montana is the best that we can make it. 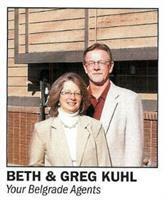 Kuhl Insurance Incorporated has access to a variety of Belgrade and Bozeman health insurance benefits for our clients. Whether you are a family looking for an individual policy in Gallatin Valley or an employer looking for a group policy, Kuhl Insurance Incorporated will help you find the benefits that match your family or business needs. Free quotes are available for individuals through our website. (Use ''get an online quote'' button above) We can also work with your business in Bozeman or Belgrade and surrounding areas to get a free group quote.